The AMS Torque/Honing Plate is an essential tool when machining your engine block. 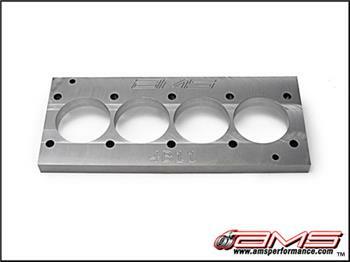 The controlled stresses of the cylinder head bolted to the block have become an important factor in the block’s integrity. To ensure integrity, we must recreate that stress by using a deck plate when boring and honing to eliminate distortion of the cylinder bore. The AMS Cam Gear Alignment Tool was designed to lock your cam gears in place while performing a timing belt replacement. You’ll no longer need to use zip ties, c-clamps or vice grips trying to keep everything in line.